App Builder Appy Pie, December 15: The app world is burgeoning with some great ideas and is doing wonders especially for the small business owners who have been able to reach out to the maximum number of customer base, who are otherwise out of their reach. The Apple App Store has become the hub for just such people who have in the past benefited greatly from it and have been earning their livelihood only through it by making their products or services available to the maximum audience. The recent change in the Apple App Store’s guidelines has however, altered this trusted system and shook up the app owners and developers alike. 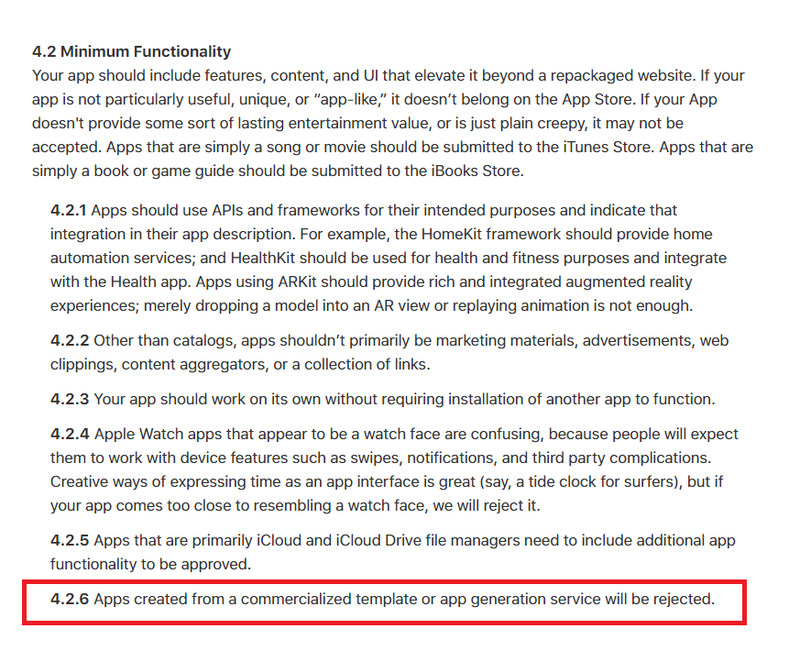 The newly added guideline numbered 4.2.6 states that “Apps created from a commercialized template or app generation service will be rejected.” This addendum has in one go caused a stir and mass rejected all the template based apps from the Apple App Store. While we are all crusading for net neutrality and a healthy economy that gives everyone an equal opportunity to conduct their business and earn their livelihood, events like these take us many steps back in the little progress that have been made on the front. The intent of this introduction and enforcement of the guideline has been stated quite clearly and it has been declared as a measure to curb the cloned apps, apps of poor quality and the spamming on the app store. The intention, though positive in its effort to enhance user experience and provide only the best quality through app store has been implemented in a manner that has indirectly led to severe losses among the small business owner community who were primarily dependent on their apps to conduct their business. To understand the extent of the impact this new guideline has had, it is important that we understand how are template apps different from the custom-made ones. The template apps are those that can be developed on the templates bought from app developers. This method of making an app brings the costs down drastically which makes it possible for those with stringent budgets to avail this highly effective medium to reach their audience with their unique services. The custom apps however are the apps that are developed from the scratch which involves a great amount of coding and programming skills. The custom apps take a long time & huge investment and is often opted for, by bigger businesses who have the time and resources to spare. The smaller businesses and entities generally do not have the bandwidth or money to have an in-house app development department, nor do they have enough budgets to outsource it. The rejection and shutting down of the commercial template apps has effectively led to some of the smaller businesses to even shut shops. Appy Pie has in this time reached out to a number of senators and congressmen to seek out support in their crusade to relieve the community of this guideline which seems to be responsible for invalidating apps from longstanding and legitimate developers who have never posed any threat to Apple’s integrity. It is motivating to know that many of them and related governing bodies and authorities are of concurring opinion in deeming this new guideline as being a drastic and harsh measure. Even though the intent was to weed out the bad actors, the collateral damage seems to be of disproportionate measure. 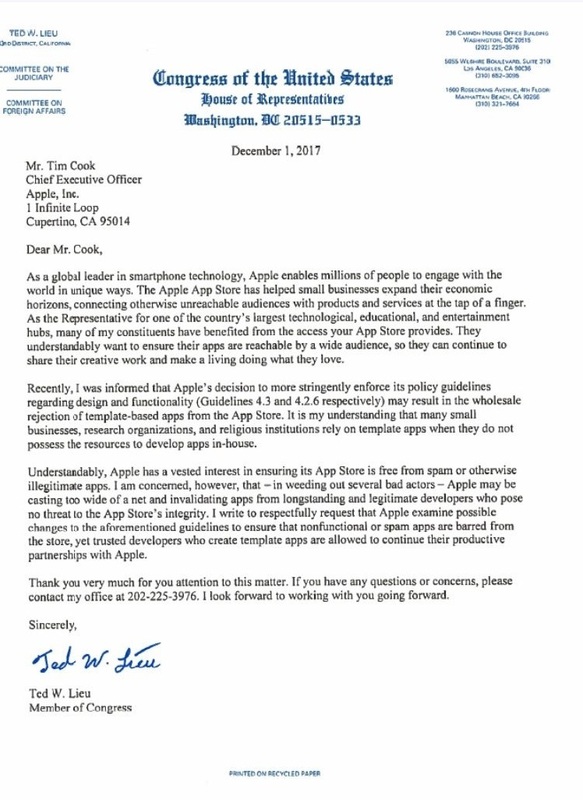 This popular opinion is only strengthened by the fact that in the recent times many of the congressmen have taken the step of reaching out to Tim Cook, CEO, Apple, by writing to them and urged them to look into the matter with fresh eyes and reconsider. We too are of the opinion that the guideline might have started from a place of good intent, but the conditions need to be re-examined and relaxed a little better in favor of inclusion and offering a fighting chance of survival to the smaller businesses. We support the rejection of spam apps and cloning, but look forward to a change in policy to ensure inclusion of the trusted developers who have been creating template apps so that they may continue a productive partnership with Apple.